Musician : We will work with every Subscribing Musician (and where possible even non-Subscribing Musician) in our 'myMI' programme. This can be extended beyond Bangalore especially throgh out Music International ONLINE Programme. Trainer : Training of Trainers; Teaching of Teachers; Coaching of Coaches; Faculty Developmnet is a KEY FOCUS for us to scale, grow and meet our Vision, Mission, Objectives and Goals. We will work with every Teacher, Trainer, Coach & Faculty (where possible even non-Subscribing) in our 'myMI' programme. 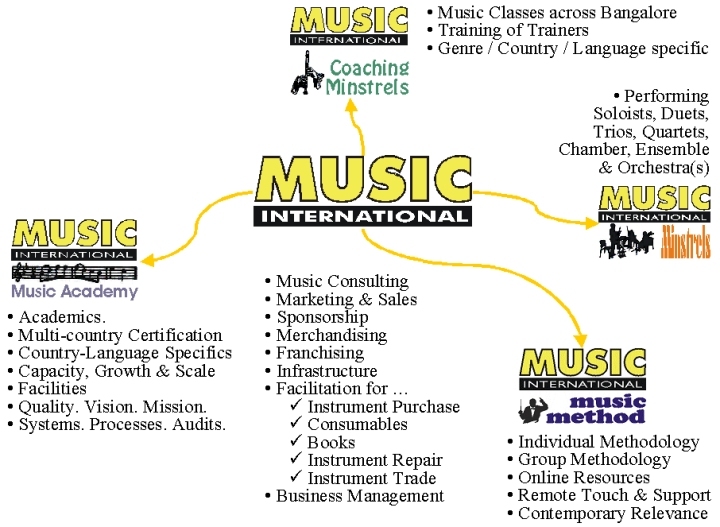 This can be extended beyond Bangalore especially throgh out Music International ONLINE Programme. Money eventually flows in from the consumer. The buying of original CD's. Attending concerts and Ticket Sales. The purchase of Instruments. Music Books. Tuition to teachers. Bands, Groups & Orchestras performing at Events. Recording Sessions. Backing Audio to a range of other human activity. HOWEVER ... each penny, paisa or pie comes from the wallet of an individual - whether a musician, a music trainer, a music afficanoado or any other. There are the venerable music institutions across Europe, the US and other coutries. Doctorate Programmes, University degrees, Examinations & Certifications. Big-Names have thus far meant a lot. We are happy to work with any Institution. While NOT affiliating with any one Institution in particular. We would be your happy to be your Institution of choice as we have the long-term Mentors for this. We actively looking at country-specific Institutional Association - apart from the UK ABRSM and Trinity Guildhall Certifications we already offer. The music industry is a multi-billion dollar industry and the Professions and Careers within this are far too numerous to even attempt to list or quanity in financial terms. 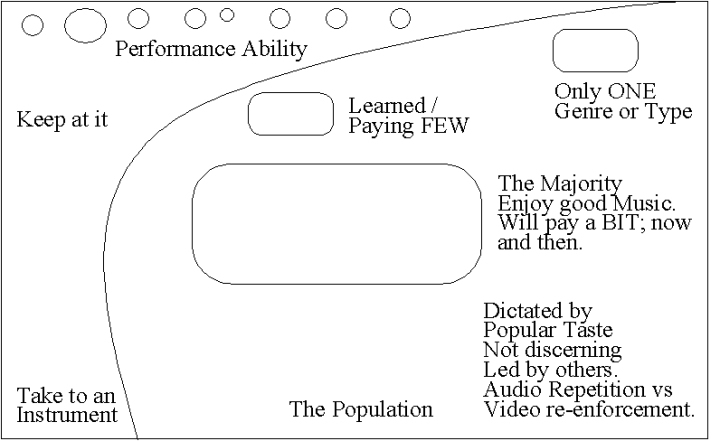 Big-Music has thus far controlled the business. We hare happy to work with any Industry Interest while NOT affiliating with any one Industry Interest in particular. We could be your single-point Industry Source. No Institution today can survive without being integrated with every other. If any Industry, Corporate, HR Department, Marketing Department, Sponsor, Brand or Product Assocation, Arts, Culture, Events ... need our Expertise and Association; we would be happy to discuss possibilities that enhance our Academy Vision. The internet has changed everything. Online stores such as iTunes, Nokie Store and Intel AppUp are viable online music stores. Anyone can be a publisher; the internet using, social networking, website brands driven market can give anyone the break in music that they are looking for. Online Music Instruction; WebCam, IPTV & VOIP. We could be your Internet Partner for your Commercial Music Aspirations. Our mission is to take the structured THEORY of Academia; the best PRACTICE of Industry; adapt to the Internet Economy and PERSONALISE all this to meet the needs of every motivated music subscriber associating with us as a paying, subscribing member of our Academy. Mainly you are a part of our Academy. Perhaps limited to a few on the piano, violin or concert flute. They have done examinations and can play the scales & arpeggios and the pieces that have allowed them to pass the Examination - not much else. At the other extreme they are the virtuoso performers, reaching the zenith of their instruments - playing the most difficult concertos for that instrument backed by entire orchestras of instruments. Their need more play-by-ear Instruction. Despite the system ... they have worked their way to be able to play an instrument with raw, real and genuine talent. Their need is an ability to read music, theory, how to learn, become self-reliant, get out of their current stagnation. The cross-over REAL talented Genius of a Musician! These few have done the Certifications and also have the ability to lead a tune or accompany another they seem to be able to do anything and at will. Their need opportunites to play with others; constantly improve Theory & Practice; enjoy their music if not more money. While happy to spare a few minutes talking or on the phone and on email for FREE; unfortunately Quality advice takes the time of Senior Faculty. We will provide music related full-range Consulting at Rs. 1,000/- per hour on fixing an appointment. Dispose of an old Instrument. Upgrade/Exchnage to a new Instrument. Recommend the right books at the right time. Creative : Composition, Songwriting, Lyrics. Theme, variations & innovation Services. Gardener Multiple Intelligences - Focus on Musical Intelligence. Gardener Music Intelligence led Behavioural Training. Group implies solo, duet, trio, quartet, qunitet, octet, ensemble or orchestra. While the above are British Certifications, we would be happy to offer German, Spanish, Italian, French or American Certication preparation; as and when such affiliations become available to us. Raise funds and Financial support to Instrument Playing purchases for Individuals. Music and related Marketing & Consultancy Services. Supporting IPR; WTO; Copyright; & Legality issues; however bearing in mind the need of emerging countries such as India; China etc. Training of Teachers. Training of Music Industry related Administrators, Managers, Entrepreneurs. Provide comprehensive Music Training Resources. NOT a focus area; Vocal; Hindustani nor Carnatic Classical; nor Hindi-Regional language popular musicof and from India of any kind. There are many others far better at catering to these needs. While encouraging you to learn the piano or church organ; they are not portable and therefore NOT our focus. This whole concept allows scale and growth. We handle between 280 and 600 students at a time. We can handle many more and this is a Best Practice and the best known way forward to create even millioons of musicians. Even El Systeme like systems may benefit from working with our Business Model.